With the rack at the bottom-most position, heat the oven to 425 degrees F.
If you have a pizza stone, place it in the oven now. In a skillet, cook the ground beef over medium heat until brown. Drain and return to the skillet. Add salt, onions, paprika, chili powder, and water. Bring to a boil, reduce heat and simmer for 5 minutes, stirring often. If using a pizza stone, sprinkle a pizza peel with cornmeal and assemble the pizza on it. Otherwise, sprinkle a baking pan with cornmeal and place the pizza crust in it and assemble there. Spread salsa evenly over the crust. Scatter the pinto beans or spread refried beans over the salsa followed by the meat and bell pepper. Bake the pizza for 10 minutes. Top with shredded cheese and bake an additional 7 to 9 minutes or until the bottom of the crust is well baked. Remove from the oven and distribute sliced jalapeños over the baked pizza. Serve with optional sour cream, black olives, and sliced green onions. By changing the meat, seasonings, and toppings, this Mexican pizza can resemble any of your favorite dishes. 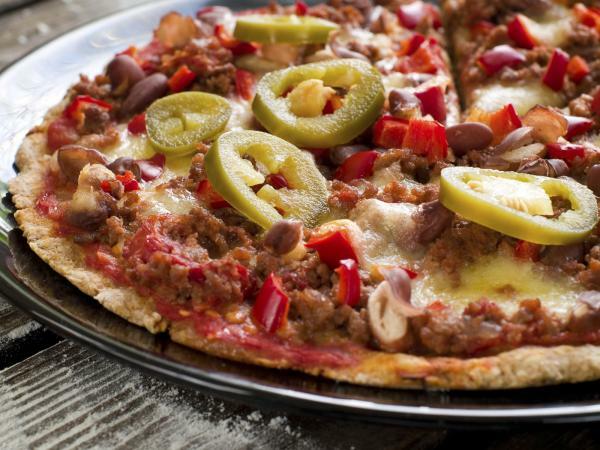 For example, swap out the hamburger for shredded chicken, add fajita seasonings, and top with sliced green and red peppers and onions for a fajita-inspired pizza. Think about what goes into different dishes, like enchiladas or burritos, to put your own spin on a Mexican-inspired pizza.